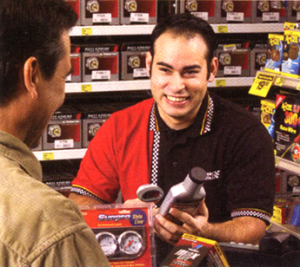 Advance Auto Parts is the largest automotive parts provider in the U.S that was built in 1932. The company’s headquarters is located in Roanoke, Virginia and operates more than 5,000 company-operated stores. As part of their environmental responsibility, every year they take more steps in reducing carbon footprint by utilizing the services of UPS, one of the largest shipments and logistics company in the world. AAP uses their services as their long-haul fleet. The company hosts a yearly annual Energy Summit, wherein major manufacturers and energy management partners are gathered to implement best practices about energy efficiencies. They also practice recycling of pallets, antifreeze and used oil filters. The company supports any programs that help the communities and making a positive effect on the lives of other people. Advance Auto Parts was founded by Arthur Taubman, who was born in Astoria New York. At an early age of 15, he was enlisted in the U.S. Navy in 1916. In 1922, Arthur discharged from the U.S. Navy and joins his brother’s auto supply business. In 1932, Arthur purchased Advanced Stores, LLC. with stores in Roanoke and Virginia. He began his journey in building a multi-state chain of auto and home supply stores. In 1938, the Advance Stores company extended in North Carolina which highlight the growth of the company. After World War II, the company reinvented their business in order to stay afloat. In 1969, Arthur steps down as the company’s President, but remains as the Chairman, while Nick Taubman accepted the role of President. The company changed its name from Advance Stores Company to Advance Auto in 1974. The company installed their first POS (Point-of-Sale) system to monitor closely the inventory. The company changes its name again from Advance Auto into Advance Auto Parts in 1985 to dedicate more on the automotive hard parts of the business. Arthur Taubman became the Vice Chairman of the Board and Garnett Smith as the President and COO of the company. They open their newly built distribution center in Roanoke in 1988, after a heavy downpour of rain that destroys their office and warehouse in 1985. Arthur Taubman died in 1994 in which he leaves a legacy with 5,000 employees and growing stores in eight states. The company went bankruptcy court approval in February of 2002 but still managed to survive by acquiring eight Karparts Auto Stores, Inc. in May of the same year. The company proved that they are the market leader in the automotive business wherein they were rated as the Best Managed Retail Company in America by Forbes Magazine in 2005. Advance Auto Parts continue to grow with their business and currently operating more than 5,200 company-operated stores in the U.S., the Virgin Islands, Puerto Rico and Canada. You should be knowledgeable in all areas of the Maintenance Department, manages the department and equipment assigned to the facility and serves as a point of contact for all construction and major repairs. The position involves activities like supplying auto parts and accessories to all store locations assigned. You will also assist in other department when and where there is assistance required. You will demonstrate technical expertise and will assume a hands-on support role for the distribution center in a team setting. You should have the ability to solve various equipment problems and coordinate with support channels. You will manage the forecasting and replenishment processes in the distribution center. You will ensure that relationships and working activities with the vendors, field teams, transportation and distribution center run smoothly. The company shows a commitment with their employees by providing them a competitive benefit to fit their employee’s needs. The health care benefits include medical, dental, vision and prescription drugs. They also give an annual preventive health assessment for their employees. Advance Auto Parts provide a retirement savings and stock purchase plan, a company paid life insurance, team member life and accidental death and dismemberment insurance, legal benefits plan and commuter benefits plan.